Pastor Douglas Brown was born in Ohio. Growing up in a truck driver’s home, he moved from Ohio to Colorado, Indiana, and back to Ohio where he graduated from Mount Vernon Senior High. He enlisted in the United States Air Force in 1990 and was honorably discharged in 1992. He moved to Greenville, SC to begin studies at Bob Jones University. After attending BJU for two years, the Holy Spirit awoke him to his need of Christ. He trusted Christ as his Savior in July 1995. He married his fiancée, Sherry Smith, in September 1995. He earned a Bachelor of Arts degree in Pastoral Studies in May 2000. His first daughter, Rebecca, was born in October 1999 and he was ordained to the gospel ministry by Colonial Hills Baptist Church in November 1999. In 2001, Pastor Brown and his family moved to Madawaska, Maine, a small French-Roman Catholic community, where he pastored at Madawaska Gospel Church for 12 years. His second daughter, Sarah, was born in June 2002. 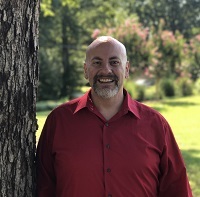 He accepted a call to return to Colonial Hills Baptist Church for him to become the Associate Pastor in September 2013. He is currently working on a Master of Theological Studies degree from Louisiana Baptist Theological Seminary.